The Projects Abroad Jamaica group on Facebook, www.facebook.com is attracting more and more past, present and future volunteers. Bridgette, our legendary Projects Abroad Jamaica director and her team of hard working staff have added numerous video clips to the site in the past few weeks. These include footage of nutrition work shops, the Children Advocacy Project, the ever popular reggae dance classes and in-depth interviews with volunteers. 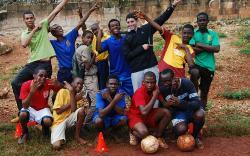 The interview with Sports volunteer David Spitz is worth a listen. David has been volunteering in Jamaica for the past 6 months and has become the resident Jamaican Patois expert. Search Projects Abroad Jamaica to join the Jamaica Facebook group. The videos and the hundreds of photos give a great taste of what Jamaica has to offer and the excellent projects that volunteers are involved in.